The Week in HD - Monday 30th September | What Hi-Fi? Hello and welcome to The Week in HD – our guide to all the must-see high-definition TV shows, films, sports and Blu-ray releases to grace your screens over the next seven days. You can also get daily updates on what's on by following our twitter feed @TodayinHD. We start the week with the release of the third season of popular zombie TV drama, The Walking Dead. 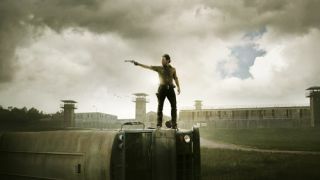 After a somewhat inasupiscious debut season, the show – based on Robert Kirkman's graphic novel of the same name – has gone from strength to strength in subsequent seasons. It's much the same as it ever was (a group of people surviving the zombiepocalypse) but the characters are a tad more experienced. As usual, this season has no problem in offing beloved characters... Out today. Michael Shannon plays ice-cold contract killer in this biopic of New York mob hitman Richard Klukinski. One of those implausible-but-true stories, Klukinski managed to convince his wife that he was working for Disney, all the while carrying out several dozen hits for the mafia. Shannon is, as usual, great in the lead role. If anything, watch it for David Schwimmer's (Ross from Friends) ponytail. Possibly the best film to come out this week, The Kings of Summer follows three teenage friends as they spend their summer building a house in the woods. While that doesn't sound too enticing, this film scooped great reviews in the US and UK and was nominated for the Grand Jury Prize at this year's Sundance Film Festival. The Champions League is back and Tuesday is the turn of Scottish champions Celtic, who take on the might of Barcelona. Barcelona's Lionel Messi will miss the match through injury but will Celtic have enough in the tank to triumph over the Catalan giants? Two Birds. Penultimate episode of the TV show that you really should be watching. This time Jason Issacs police detective finds himself on the wrong side of the law, convinced that there's a conspiracy surrounding the circumstances of his car crash. Can he prove it? Who are You, Really? Season opener of ridiculously-over-the-top vampire drama True Blood. To say too much about this episode might ruin it for those who didn't catch last season's finale, but it's safe to say that the conflict between humans and vampires gets racheted up a notch. A crucial match for David Moyes' United team as they look to bounce back from poor defeats domestically. Despite losing a few players over the summer, Donetsk will be no pushovers on their home patch. News Night with Will Mcavoy. Quite possibly the best episode of the season so far. Will receives a phone regarding his father's health as the newsroom team deal with the release of the George Zimmerman 911 tape. Honestly, did you ever expect to see Wigan Atheltic play in Europe? Here's your chance to watch them in action against Slovenian team Maribor. Trust Me. Following in the footsteps of Hannibal, Universal raided their film vaults and turned out a TV adaptation/prequel of Alfred Hitchcok's Pyscho. While the jury still seems to be out for the show, a second season has been confirmed. Trust Me sees Norman escaping from the Deputy Sheriff's house but leaving some vital evidence behind. Another week, another smorgasboard of topical news items for the Mock the Week team to dive in to. Guest includes Milton Jones, Miles Jupp and Josh Widdicombe. The tenth President's Cup starts on Thursday. The United States take on a team of international players with a host of familiar faces. Phil Mickelson and Tiger Woods will be teeing off for the home team as they look to secure another trophy. 0-8-4. Last week's premiere of Marvel's foray into live action television was…disappointing. Hopefully the second episode will show some signs of improvement. 0-8-4 sees Coulson and his agents travel to Peru to investigate an unknown object but things take a turn for the wose when they run into Comandante Camilla. A Low-key throwback to 70s crime movies, Jack Reacher infamously sees the 5'7" Tom Cruise play the 6'5" ex-soldier. Regardless of the difference in height, Cruise is more than a match for the role as he takes on Jai Courtney's antagonist. The plot is a bit predictable, but the action's good, with a standout car chase. Watch it for Werner Herzog's "The Zec", a surprisingly creepy villan performance from the soft-spoken German director. Even though it's still early days in the season, City will be looking to get their title aspirations back on track. Everton have a good record against City in recent seasons and will be looking to continue their own, unbeaten start to the season. Even if you don't like baseball (or understand a single thing about it), this drama is still an entertaining watch thanks to performances from Brad Pitt and Jonah Hill. Moneyball, based on the book by Bill James, sees Pitt play Oakland A's manager Billy Beane, who famously took an unfancied team to the top of the game using pioneering new methods. 2013 winner of the Best Picture Oscar, Ben Affleck's career rehabilitation continued with this drama set in the 1970s. Affleck plays a CIA agent who's trying to bring back six American citizens stranded in revolutionary Iran. Not quite as tense as it could be, it's still a good film with Affleck hiring a who's who of American actors in various roles. He takes the lead role and the reigns behind the camera. Fantastic beard, too. The Tin Man is Down. It's back. After a second season that, like so many other shows, did not live up to its first season. Season Three catches up with last season's events, with Brody still at large and Claire Dane's Carrie the focus of a Senate investigation.